HAPPY 25th ANNIVERSARY TO APPETITE FOR DESTRUCTION! It's hard to believe that it's been 25 years since Appetite for Destruction was released. When Guns N' Roses bust onto the scene in 1987, the musical landscape was changed forever. Finally, a band that seemed "real." Guns N' Roses' Appetite for Destruction spoke to kids in 1987 with it's raw honesty, and as a result, it shot straight up the charts. Selling over 30 million copies worldwide since it's release, "Appetite" contains the hit songs that still strike a chord with generations of rock fans today. To celebrate this monumental anniversary, we're giving away a copy of Reckless Road: Guns N' Roses and the Making of Appetite for Destruction. 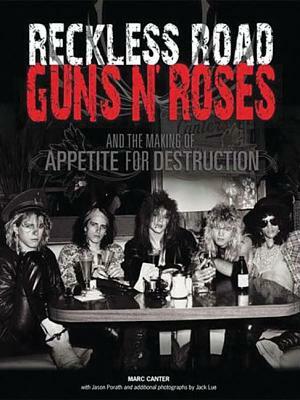 Reckless Road is not only the best book written about Guns N' Roses, it is one of the best rock books ever. Author Marc Canter had unlimited access to the band during their genesis, and the photos and information contained in this book are priceless. To enter, simply leave a comment here telling us why you think you should win. You can enter a second time by following us on Twitter, and then Re-Tweeting this tweet: "Appetite for Destruction 25th Anniversary Contest. Re-Tweet to win a copy of Reckless Road. Details http://bit.ly/LpGtR1 ‪#gunsnroses‬ ‪#AFD25‬"
We’ll give you a third chance to grab a copy of this amazing book by "liking" us and leaving a message on our Facebook wall. Be creative. Once the contest entry period closes we’ll tally all the entries from our forum, Facebook and Twitter and pick 1 winner at random. When teenager and amateur photographer Marc Canter set out to document his best friend Saul Hudson's rise as a rock guitarist in 1982, he never imagined he was documenting the genesis of of the next great rock 'n' roll band. His friend became the legendary guitarist Slash, and Canter found himself witnessing the creation of Guns N' Roses front and center. The candid shots contained in Reckless Road, taken as the band toured in 1985-1987 and made the legendary album Appetite for Destruction, capture their raw, blood-sweat-and-tears performances as well as their intimate moments. Containing original gig memorabilia including show flyers, ticket stubs, set lists, press clippings, and handwritten lyrics as well as in-depth interviews with band members and the people closest to them, Reckless Road offers an explicit, first-person perspective readers won't find anywhere else. To enter the contest, leave a comment here telling us why you should win. You can enter a third time by following @gunsnfnroses and then re-tweeting this tweet: "Appetite for Destruction 25th Anniversary Contest. Re-Tweet to win a copy of Reckless Road. Details http://bit.ly/LpGtR1 ‪#gunsnroses‬ ‪#AFD25‬"